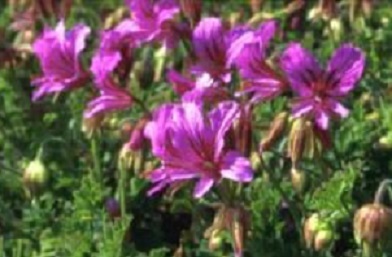 An unusual and original species of Pelargonium from South Africa, with dark green leaves and big magenta flowers in mid to late summer. Great for rockeries, pots, and beds where it is used successfully as ground cover. Also good in hanging baskets and window boxes. Grows to a height of about 30cm. Likes a sunny position in well drained soil, with underwatering in summer. Will tolerate a coastal site. Pack of 10 seeds. Sow from spring through to autumn. Rock Pelargoniums flower about a year from sowing. They do not tolerate frost, and are best protected over winter. Sowing instructions and a colour photo are printed on the packet. Sow in spring to autumn in moist and lightly drained seed compost. Include coarse sand in the seed compost. Cover seeds lightly with clean sand. Germination takes 10 to 14 days. This is an original species of Pelargonium which takes about 12 months to flower, so best to sow in the spring/summer before planting out the following year. Protect from hard frosts. Plants are evergreen – they do not grow much in winter unless kept in a heated greenhouse. They start to grow vigorously in the spring once the weather warms up. Stem cuttings can be taken in summer. Trim back plants after flowering, when cuttings can also be taken if protected from frosts. Plants flower over extended periods when grown in a heated greenhouse.